Whatever the season, these cute and cuddly robes promise sweet dreams for your favorite doll. Make a long robe with long sleeves for colder days or a short robe with short sleeves for summer. This easy PDF pattern offers a versatile robe which allows for Pajamas to be worn underneath; it has working pockets in the side seams and carrier loops to keep the belt tie in place. It is also fully lined and therefore reversible. Use woven fabrics such as Fleece, Flannel or Waffle-Weave for the Robe and line it with Satin, Pongee or Cotton; trim the sleeve edges with ribbon or lace if desired. This pattern is designed to fit 14.5” dolls such as WellieWishers®. 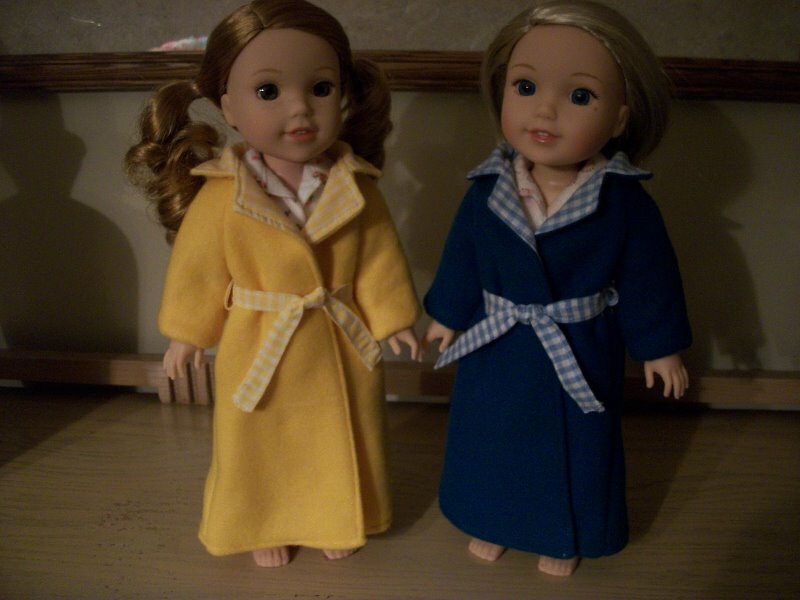 Please see our other listing to make these robes for 18" dolls such as American Girl®. Fabric Used: The Long Robe with Long Sleeves was made using Fleece. The Long Robe with Short Sleeves was made from Flannel and the Short Robe with Short Sleeves was made from Waffle Weave. The longer gowns were lined with Satin, while the Short Robe was lined with Lightweight Cotton. Matching Thread, Marking Pen, Point Turner, Loop Turner, Clear Tape, general sewing supplies. nice design. liked the neckline better than the one i already had. fits well. easy to sew. I made two of these robes in fleece lined with gingham fabric. The belt was difficult to make in fleece, so I made it with the gingham fabric.